Probiotics in Yogurt and Other Types of Food: What More Are You Supposed to Look For? Probiotics in yogurt? Yes, they have become quite common, not only in yogurt products, but also in other food choices. So what exactly are probiotics? Are food products with probiotics enough to provide the benefits that our digestive system and our whole body need? There are a lot of food products out there claiming to contain probiotics. The popularity of probiotics started when studies emerged which highlighted the benefits that these microorganisms provide to our digestive systems. Probiotics are microorganisms that serve to strengthen the host and are said to be beneficial in terms of improving the microbial balance in the intestines. These live microorganisms are commonly found in fermented food products, with yogurt being a primary example. They can also be part of soy products and are even used as main ingredients for dietary supplements designed specifically for the gut. If probiotics in yogurt and in other food products can help keep a balanced digestive system, what exactly then are their effects on our overall health? Primarily, probiotics are purported to help treat various gastroenteritis forms. They are also said to be effective against diarrhea, especially the kind associated with taking antibiotics. There have also been claims that probiotics are effective in lowering cholesterol, blood pressure and have even been touted as an effective tool against the development of colon cancer. Despite the numerous studies promoting these benefits, some experts believe that further studies are needed to be really sure whether probiotics do have these beneficial effects and whether the extent of their effects are enough to cure certain illnesses. So, if probiotics are good for the gut, is eating food products that contain them enough? As mentioned earlier, further studies are still needed to make any definite conclusion on the issue. Although probiotics do help in maintaining balance in our digestive systems, there are some studies which claimed that in the event of food processing, the effectiveness of these microorganisms actually diminishes. There are still no clear evidence that probiotics’ altered state following processing has enough power to really benefit the gut and consequently, the whole body. In addition, the interaction of probiotics with other components needed to manufacture the final food product may have an effect on how well probiotics will be able to perform their desired functions. Do you need more for your gut? There are a lot of benefits to consuming probiotics in yogurt and in other foods, but if what you are looking for is a solid support for your intestines and your whole digestive system, prebiotics may provide a better option. Prebiotics are dietary fibers that stimulate the activities of good bacteria inherently found in our stomachs. They are food ingredients that can be found in certain plants, like kiwi fruit, garlic, onion, leeks and asparagus among others. These fibers are non-digestible and are therefore able to retain their original structure even when they reach the intestines. In simpler terms, prebiotics can work with what our stomach already has. It has also been touted as effective in stimulating metabolism, which can only mean good things for our gut and our body as a whole. Aside from consuming fructan-containing plants like kiwi and garlic, people can also get prebiotics by taking dietary supplements that contain these dietary fibers. The best thing about opting for prebiotic-based nutritional supplements is that the final product is able to maintain the original structure, and therefore the complete benefits, of the prebiotics. In addition, nutritional supplements are easier and more convenient to take compared with making a list of the foods that contain prebiotics and filling your daily diet with all of these foods. However, this does not mean that all dietary supplements with prebiotics have equal efficacy. Your best bet will be a product that contains prebiotics and is made from all-natural ingredients. 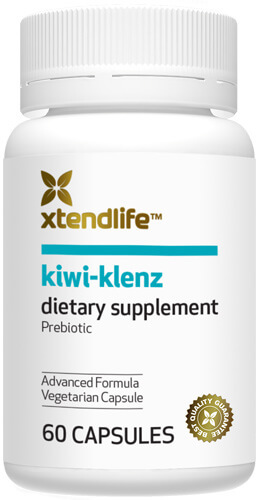 One example that you may want to try is Kiwi-Klenz from Xtend-Life. Among the digestive health supplements out there, this particular product is specifically focused on the benefits of prebiotics and has been manufactured using only the purest components. Probiotics in yogurt are good for your digestive system, but if what you are looking for is a product that is highly effective when it comes to protecting and strengthening your digestive tract, then opting for prebiotics will be the best decision you can ever make.